Meet Diego. Look at him being goofy...he was just talking to his foster Mom. He is a gorgeous flame point Siamese male that is very talkative. He wants you to look him in those beautiful blue eyes and talk to him, and he will respond to you! Your house will never be lonely with him around. He will sound off when you call his name. Diego's perfect house would be as an only kitty or with one other kitty, a cat tower, furry mice, a string on a pole, a lap to sit it and a human to talk to. He is a dream, his points are orange instead of the traditional chocolate points, means his tail is orange stripped and his toes has some orange tints. He is microchipped and fully vaccinated. We offer a two week trial for all of our local adoptions. 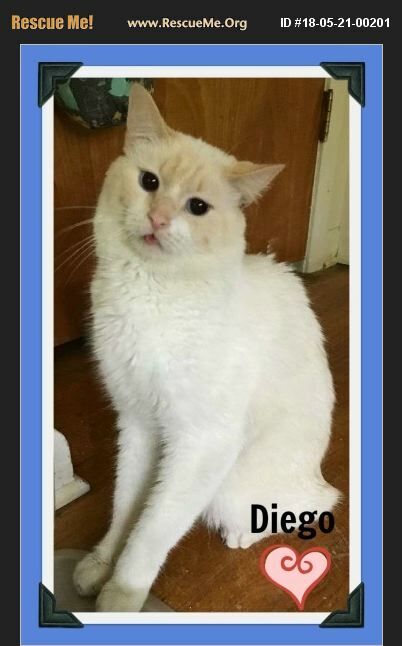 Diego will not disappoint you, he has the goofiest poses that will make you laugh and smile. Thanks for viewing our kitties! Search Snow Camp on this site, to see all the variety of kitties we have!